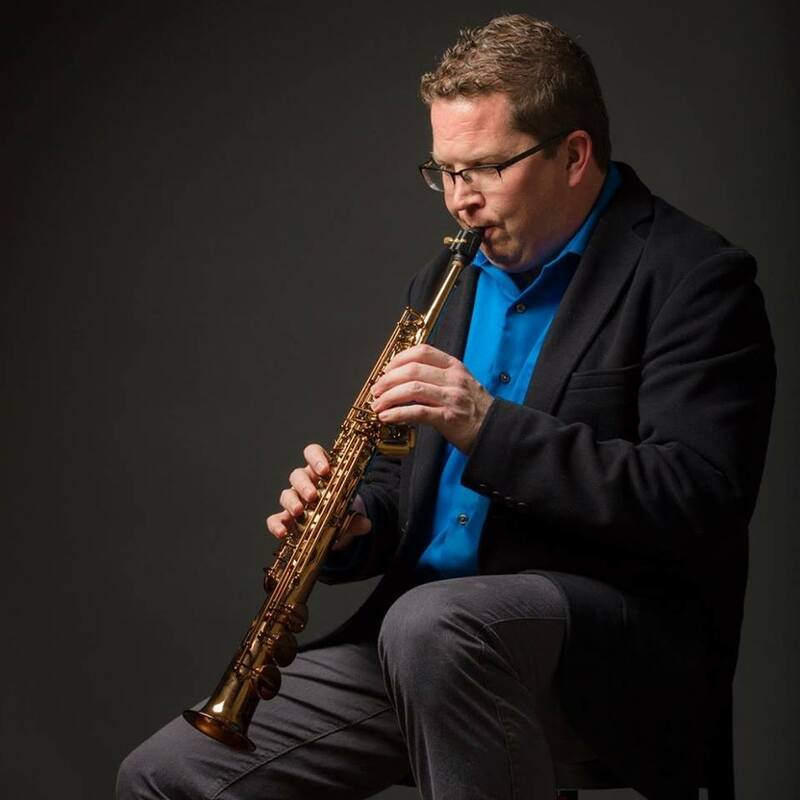 Internationally known Houston saxophonist, composer and music educator Woody Witt will be the special guest artist at the free ‘Jazz @ Lee College’ concert set for Friday, Nov. 6, at the Performing Arts Center. An annual showcase that also features the college’s own Thursday Night Band and Bayou Big Band, Jazz @ Lee College will begin at 7:30 p.m., in the main performance hall. Witt holds a doctorate in musical arts from the University of Houston, where he is also an Affiliate Artist. He teaches full-time at Houston Community College, and served as the manager and artistic director of Cezanne — a world-renowned venue and one of the city’s only jazz clubs — for 10 years. Witt has released and/or been featured on more than 25 recordings, most recently his solo album “Pots and Kettles” on the Bamboo Music label. He has been a Yamaha Performing Artist for more than 15 years and in 2010 was selected to receive a grant from Chamber Music America. When former Baytown City Councilman Scott Sheley retired from a 35-year career in education, he headed right back to school — only this time, as a student at Lee College. “Lee College in itself is a great Broadway show,” said Sheley, who first attended the college from 1972-1974 as an athlete on the now-defunct Rebel Swim team under Coach Ron Ummel, an instrumental figure in his life. Like many of the students he encounters today, he juggled his nightly studies in the aviation program with grueling morning practices and three different jobs. In need of a fine arts elective to fulfill requirements for his associate’s degree in General Studies, Sheley enrolled this semester in a theater class taught by Kim Martin — an old and favorite friend with whom he participated in the drama program at Ross S. Sterling High School. With Martin serving as director for “Treasure Island,” he felt more comfortable and confident in auditioning for the show. To prepare for his debut as Dr. Livesey, Sheley watched at least 25 movies in hopes of polishing his delivery of the character’s British accent. Plans for cannon fire and musket fights live on stage also pushed his physical limits during rehearsals for the play, which is based on the classic Robert Louis Stevenson tale of pirates and buried treasure. In fact, “Treasure Island” was one of the first stories that Sheley, who struggled with reading as a child, successfully completed on his own. It’s one of many ways that his post-retirement return to Lee College — as a student, president of the Former-Lee alumni association and member of the Monica Boyd Foundation Board of Directors — has helped bring his life experience full circle. “Treasure Island” will be at the PAC from Oct. 29-Nov. 1, with shows at 7:30 p.m. Thursday, Friday, and Saturday, and a 2:30 p.m. Sunday matinee. 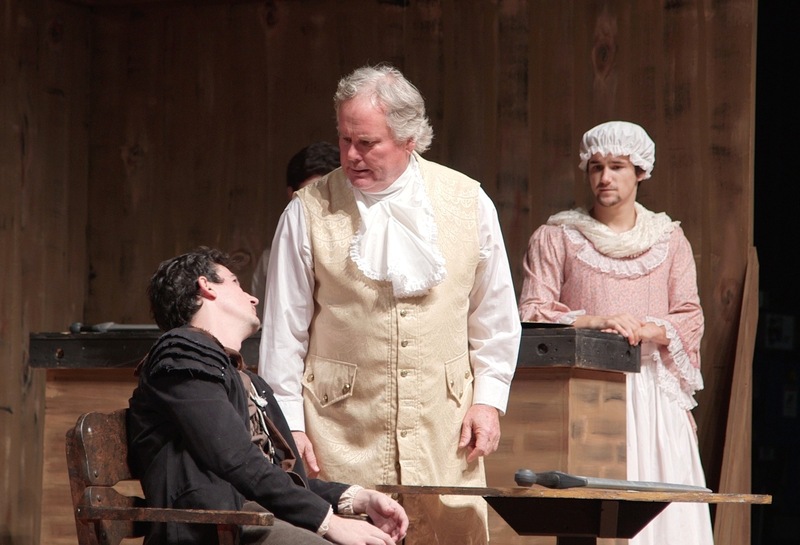 Tickets can be purchased online at www.lee.edu/pac, or by calling the Box Office at 281.425.6255. BAYTOWN, TX — Lee College has again been named one of the best community colleges in the country — this time ranking among the nation’s top ten according to a new study by SmartAsset, a financial technology company that has been featured in The New York Times, Wall Street Journal and Forbes magazine. Lee College is the only community college in Texas to make the top ten on SmartAsset’s list, which ranked the 100 best community colleges in the United States. The company compiled its rankings based on an analysis of 565 public two-year colleges that used four key metrics reflective of quality, cost, student success and return on investment: the graduation and transfer rate at each school; cost of in-state tuition; ratio of average starting salary to the overall cost of attendance; and the student-teacher ratio. Based on SmartAsset’s calculations, Lee College took the ninth overall spot on the list — due in large part to its wide variety of program options, flexible class offerings to meet the needs of working students and general affordability. The SmartAsset ranking is the second time this year that Lee College has received national recognition as a top community college. In September, Lee College was named one of the 50 best community colleges in the country by WalletHub, which examined 610 institutions nationwide. In May, the Brookings Institution ranked Lee College second in the nation for contribution to the economic success of its graduates, placing in the top 1 percent of all community colleges in the United States. In 2014, PayScale ranked Lee College fourth among U.S. two-year institutions for graduate earning potential, and Community College Week recognized the college as one of the top associate-degree producers in the country. 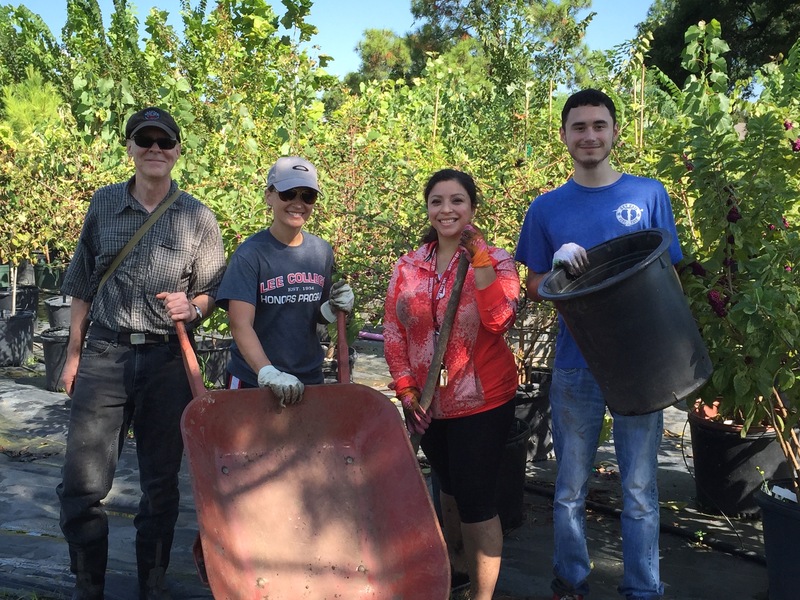 Students in the Lee College Honors Program are volunteering their time this semester at local nature centers, including the Exploration Green tree nursery in Clear Lake. Pictured from left to right are instructor and certified Texas Master Naturalist Jerry Hamby; instructor and Honors Program coordinator Georgeann Ward; and Honors Program students Maryori Portillo and Adam Naiser. Students in the Lee College Honors Program are taking their classroom exploration of humanity and nature into the real world, volunteering their time this semester at the Eddie V. Gray Wetlands Education Center in Baytown and the Exploration Green tree nursery in Clear Lake. The student volunteers are part of the Human Condition, a unique Honors Program course that is team-taught this semester by instructors Georgeann Ward and Jerry Hamby. The seminar-style class combines the disciplines of English and the Humanities, emphasizing open discussion and encouraging students to ask bold questions and engage in critical thinking about the world in which they live. Ward and Hamby introduced a unit focused on humanity’s relationship with nature, making time spent at the local nature centers even more meaningful. The Human Condition class has been given assigned reading from “The Purposeful Place” by Richard Louv and “Writing Takes Place” by Sidney Dobrin, two pieces that address the ways that environmental spaces affect and influence the human experience. Completing community service also makes the students even stronger candidates for transfer to four-year institutions, which the Honors Program endeavors to do by providing opportunities for scholarship, leadership and service. “Our work with Exploration Green and the Eddie V. Gray Wetlands Center help us promote those goals,” Ward said. The students’ decision to give their time to Exploration Green, in particular, struck a chord with Hamby, a certified Texas Master Naturalist who has completed about 100 hours of training and 250 hours of volunteer work to earn and maintain that credential. He has long been drawn to the natural environment and spends a significant amount of personal time in the tree nursery himself – planting and re-potting trees, weeding plants and helping maintain the irrigation system for the 1,000 trees on the property, representing more than 40 different species. Nurturing and learning about plants, animals and the biodiversity found in the Houston region gives Hamby a feeling of joy, sense of purpose and awareness of the power of place. He hopes the same lessons will resonate with the students in his classes, much in the way the seeds they plant at the nursery may blossom into trees that endure for generations. Ginger Restovic, member of the PVF Roundtable Board of Directors; Ronn Haddox, Chairman of the Lee College Board of Regents; Dr. Dennis Brown, President of Lee College; and Dr. Cathy Kemper-Pelle, Vice President of Learning for Lee College. 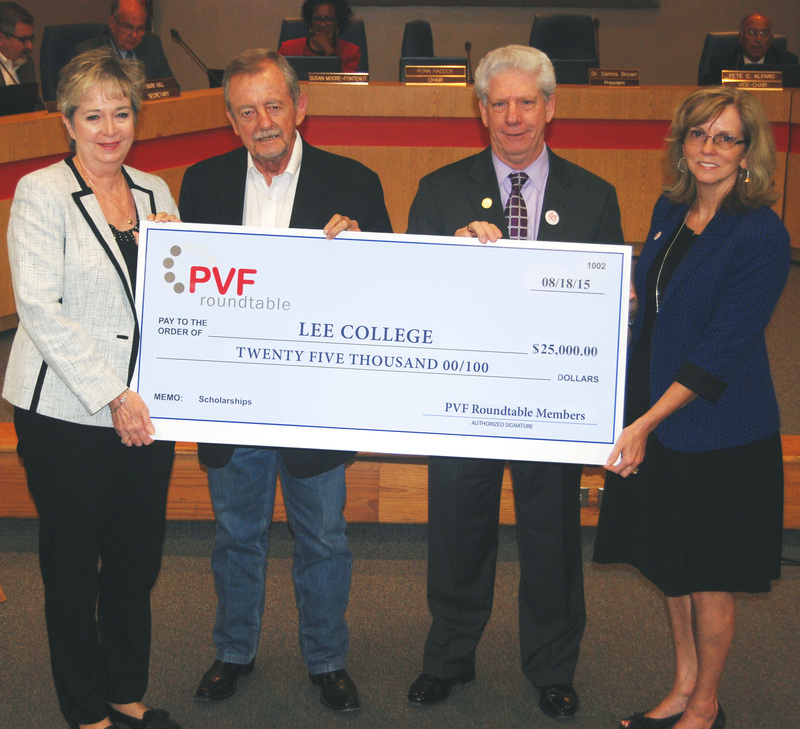 BAYTOWN, TX — Lee College has received a $25,000 donation from the PVF Roundtable for scholarships that will support students in the craft trade programs of pipefitting, welding, machining and millwrighting. 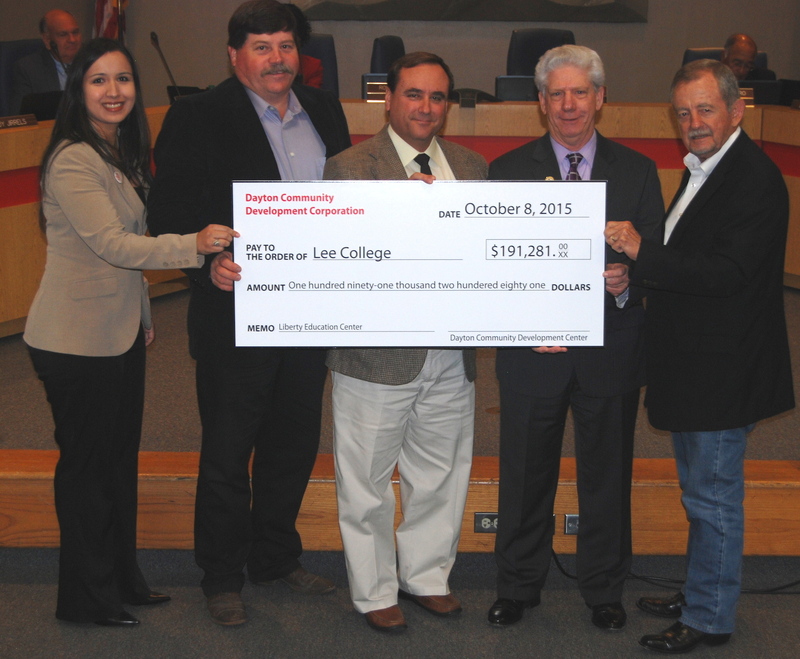 Lee College administrators accepted the scholarship donation check during a special presentation at the October meeting of the Board of Regents. The PVF Roundtable is an organization of companies and professionals involved in the pipe, valve and fitting industry. In addition to providing an open dialogue to exchange relevant information and creating awareness of industry affairs, the group is committed to helping prepare for the future growth of the industry through its support of educational and training institutions. Ginger Restovic, a member of the PVF Roundtable Board of Directors, told the Regents the organization hopes to make the scholarship donation on an annual basis. After focusing its attention for many years solely on industry advancement, roundtable members recognized the importance of nurturing future generations of skilled workers needed for some $50 billion in projects slated for completion in the Gulf Coast region. Dr. Christina Ponce, left, Vice President of Student Success, Resource Development and Workforce at Lee College; Richard Till, President of the Dayton Community Development Corporation Board of Directors; Courtland Holman, Executive Director of the Dayton Community Development Corporation; Dr. Dennis Brown, President of Lee College; and Ronn Haddox, Chairman of the Lee College Board of Regents. BAYTOWN, TX — Lee College recognized this week the Dayton Community Development Corporation and Liberty Community Development Corporation for their contributions to establish a new education center that will offer a dual credit institute, post-secondary educational programs, fast-track workforce training and community education to students in the South Liberty County area. Centrally located on State Highway 146 bypass in Liberty, the Lee College Education Center – South Liberty County advances the college’s commitment to enhance the academic resources and workforce training offered throughout the region. The Dayton Community Development Corporation and Liberty Community Development Corporation each provided grants of more than $191,000 to help cover the costs of computers, lab equipment, technology, learning materials and other resources needed at the new facility. 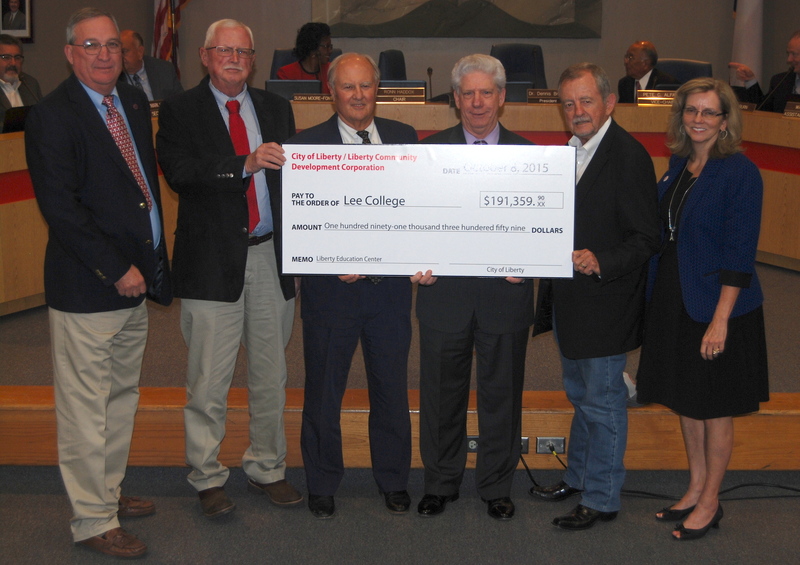 Lee College administrators formally accepted the grant money and expressed their appreciation to Dayton and Liberty community leaders during special presentations at the October meeting of the Board of Regents. Gary Broz, left, Liberty City Manager; Dennis Beasley, President of the Liberty Community Development Corporation and Liberty City Councilman; Carl Pickett, Mayor of Liberty; Dr. Dennis Brown, President of Lee College; Ronn Haddox, Chairman of the Lee College Board of Regents; and Dr. Cathy Kemper-Pelle, Vice President of Learning at Lee College. Expected to open in January, the Lee College Education Center – South Liberty County will host dual-credit classes that will allow students in five neighboring school districts — Anahuac, Dayton, Liberty, Hardin and Hull-Daisetta — to earn a college credential by the time they graduate. The Dual Credit Institute will offer coursework in the high-demand technical fields of process technology, electrical technology and computer-aided drafting and design, along with academic transfer courses. The Lee College Education Center – South Liberty County will also provide a variety of community education classes and an emergency medical technician program that will start in the spring semester, pending state approval. Sophomore forward Duop Reath, seen here in a 2014-15 game against Coastal Bend College, is among the standouts on the Lee College Basketball Team who will be signing autographs Saturday, Oct. 24, 2015, at Rebel Madness. The meet-and-greet event for players and fans is free and open to the public. With the regular season set to begin at the end of October, the Lee College Basketball Team is looking to spread Rebel Spirit in Baytown and beyond with a special event for fans to meet the players and see them in action. “Rebel Madness” will be held 6-7:15 p.m., Saturday, Oct. 24, at the Lee College Sports Arena. Admission to the event is free, and the entire community is invited to attend. The Runnin’ Rebels will show off their skills at Rebel Madness with a slam-dunk contest and 3-point shootout. Fans can get autographs from their favorite players, enjoy music and grab one of the 300 t-shirts and other items that will be given away. The Lee College Basketball Team has a long history as a breeding ground for top talent from around the United States and even abroad. Under the leadership of head coach Roy Champagne for the last 22 years, more than 100 Runnin’ Rebels have moved on to play at the NCAA level in programs at universities like Baylor and Virginia Tech. Some of the former Runnin’ Rebels have also built professional basketball careers overseas. Standouts from the 2015-16 squad include sophomore guard Tim Coleman, sophomore shooting guard Branden Jenkins and sophomore forward Duop Reath. All three players rank in the Top 12 Junior College prospects in the country and are being recruited by the Power Six conferences of NCAA men’s basketball. The Runnin’ Rebels will kick off the regular season Saturday, Oct. 31, in Plano, against Odessa College as part of the East v. West Texas Challenge. The first home game is Friday, Nov. 6, against Collin County Community College. For a full schedule, visit www.lee.edu/athletics.